Video Based Auto Tracking for Virtual Joint Recognition. 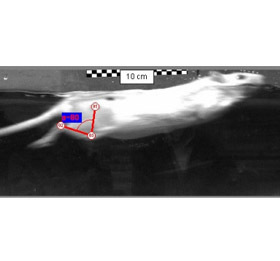 Use MaxTRAQ VJR to calculate the position of the knee based on known positions of the hip and ankle in rodents. The lengths of the femur and tibia are assigned based on post-mortem measurements or estimates based on age, weight and gender- matched controls MaxTRAQ VJR calculates and plots the position of knee and generates accurate estimates of the hip, knee and ankle angles that are critical to understanding the hindlimb kinematics during walking or swimming.